Salzburg, famous as the stage for the movie Sound of Music and home of Mozart, this beautiful small town is nestled between mountains along the Salzach River in Austria. The Alstadt (Old Town), on the left side of the river, has been listed as a UNESCO World Heritage site since 1997. In the summer of 2014, I was studying abroad in Innsbruck, Austria, as part of a law school program. We had long weekends to explore nearby cities or countries. My roommate and I spent one weekend exploring Salzburg and Vienna. We were on a budget so we had to skip the Sound of Music tours. This is a main attraction for people visiting Salzburg, so if you’re interested in hearing the hills sing, click here to learn more. Lucky for us, if you skip shopping on Getreidegasse street and the tour, its easy to see a lot of Salzburg without spending a lot of money, especially if you opt to stay at a hostel. To save money, my roommate and I stayed at a hostel. The place she chose was very unique and located on the mountain Mönchsberg (named after monks at St. Peter’s Abbey nestled below the mountain). There are a few ways of getting to the hostel. (1) You can take a taxi to the front doors. We did this when we left the hostel. The taxi picked us up outside the beer garden. (2) Take a taxi to the museum entrance at the foot of the mountain and take the elevator up, then walk some more. This is what we ended up doing when we arrived. The taxi we hailed from the train station stopped on the street in Old Town and we were instantly confused. There was no hostel, just stores and doors that appeared to lead into the side of the mountain. The sign above the doors were for a museum, which was just as puzzling to us. We soon discovered that behind the doors was an elevator (MönchsbergAufzug) to the museum located on top of the mountain. The elevator drops you off at the entrance to the Museum der Moderne Monchsberg. We didn’t have time to walk around the museum on our stay. And when we first arrived we had luggage and were tired (after missing our train in Innsbruck a few times), so we skipped the museum. But we did stop to take pictures. Then we kept trying to find our hostel. There is a long circle drive in front of the museum. We should have turned left down Mönchsberg street, but ended up taking the scenic route. If you Google Map the walk, it can’t figure out how to get to the hostel by walking. But, if you pull up the map, you’ll see a Roman wall. If you walk towards this, you’re headed in the right direction. You’ll pass through a small tunnel in the wall. You’ll then turn left and should be able to see the hostel and the beer garden outside. (3) Walk up a lot of steps from Old Town and then down a trail to to where the hostel is located. I do not recommend using this route when you first arrive with luggage. It’s a long, tiresome climb/walk. We used it when going into and leaving Old Town. This way we didn’t have to pay for the elevator or a taxi. You’ll get nice views, too. It’s also attached to the path we took to the Fortress. There are a lot of really nice hostels nowadays. This is more typical of the early, low-maintenance hostels, the kind you think of when you hear the word “hostel”. And it is definitely a unique experience. I’d recommend it to younger travelers (or older ones who don’t need comfort when traveling) who are trying to save money. I was 26 at the time. Nowadays, I prefer comfort. My roommate and I went with the cheapest room available. It sleeps 6 strangers. It’s also in the attic (up a very small staircase…good thing we packed light!). I highly recommend bringing earplugs (wherever you travel). We forgot ours….big mistake. There was a guy, already asleep when we got back to the room, who snored. It was the loudest snoring I have ever heard in my life. Bright side was that we got an early start in the morning since neither of us ever really fell asleep. The first thing we did when we arrived we look for something to eat (and search for towels since we forgot the hostel wouldn’t have any). We quickly discovered that a lot of places close early in Salzburg. We found a few open restaurants, but had to venture across the river to find more reasonable prices. By the time we left dinner, the sun was setting and the streets were nearly empty-on a Thursday night. We weren’t able to buy towels (which meant we skipped showering and washed our hair in the sink), but were able to take several nighttime photos. Once we were done frolicking, we still had to climb all those steps to get back to our hostel. By then it was very dark when we reached the top of the stairs. If it wasn’t for the snoring guy we probably would have slept amazingly after all the walking we did. We began the morning with breakfast at the Hostel. We managed to get a seat inside by the window, right on the cliff edge. Then we went to our first destination for the day, Festung Hohensalzburg. It was first on our list for two reasons: (1) it was within walking distance before having to go down all the steps, and (2) we wanted to beat the crowd. It’s a 20 minute walk from the hostel. But, if you don’t stay at the hostel, you can walk from the city center or take the funicular. You cannot drive there. The walk from the city, uphill takes about 20 minutes. The cable car is a 1 minute ride. It costs €4,40 for a round-trip (or at a discounted price with ticket to Fortress) and runs every 10 minutes. It’s located behind St. Peter’s. We took the funicular when we left the fortress since our next stop was Old Town and we weren’t up to walking more than we had to. When you arrive at the Fortress, if you haven’t already purchased tickets online, you can do so at the Cash Desk. We bought ours at the Cash Desk and chose the cheapest option (€12 Standard Ticket) since we were on a budget. This meant we missed out on the Prince’s Chamber and Magic Theater. After you buy tickets, you still have a steep walk up the hill. In the picture below you can see the steps and a railing in place for assistance. Festung Hohensalzburg is an 11th century fortress, built for protection as well as a symbol of power. The prince bishops held an enormous amount of wealth and power in Salzburg. Though the fortress was never under any real threat or siege, there were times of instability. It was during those times that the Prince Bishop would reside inside the fortress walls, rather than at the Residenz in the heart of Old Town. The construction of the fortress was commissioned in 1077 by archbishop Gebhard I of Helffenstein. It was completed after his exile in 1085. In 1500, Archbishop Leonard von Keutschach made changes to the fortress and the result is what we see today. The Hasengraben bastion was an addition to the fortress during the “Thirty Years War” (1618-1648). As weaponry improved, the archbishops needed somewhere to place the new canons. Not pictured below, is the The “Reckturm” watchtower. The tower became a dungeon in 1640, and a torture chamber was constructed in the 19th century. Archbishop Leonard von Keutschach is responsible for turning Hohensalzburg into more than just a fortress, but a princely castle. He built a residential tower and turned the High Rooms (Hoher Stock) into grand state rooms to both impress and intimidate visitors. As a result, his image and coat of arms can be seen around the fortress. His coat of arms, bearing a beet (or turnip) is displayed around 53 times. Pictured above is the “The First Archway”, located underneath the Hoher Stock (High Floor) and leads to the oldest part of the fortress. You can spot more turnips in the coat of arms beside and above the archway. There was a unicorn one! Below is what the chapel looked like originally and the remnants that can be seen today. For an interactive map of the fortress, click here. To learn more about the fortress, check out Salzburg’s website. Since we didn’t purchase tickets to see the stately rooms, we ended up leaving by 11 am. Which was perfect timing because that is when the crowds started showing up. We took the funicular down to Old Town. You exit near St. Peter’s Church. The Monastery dates back to the 7th century. The monastic brotherhood stills exists today, making it the “oldest monastic order in the German-speaking world.” St. Peter’s (Petersfriedhof) includes the church, an art gallery, the cemetery, and the catacombs. The cemetery, outside of St. Mary’s Chapel, is Salzburg’s oldest cemetery, dating back to 1627. It’s also beautiful. In St. Peter’s cemetery, you can find Nannerl, Wolfgang Mozart’s sister’s, grave. One thing I realized during my stay in Austria is that they continue to celebrate their loved ones who have passed on by keeping the cemeteries filled with beauty. (Check out my post on Hiking Around Innsbruck for another example) I wish we did the same in America (though its probably difficult in the Texas weather). For Sound of Music fans, you’ll want to see the Catacombs. Entrance is free with the Salzburg Card. The Catacombs are carved into the face of the Mönchsberg. The Chapter Fountain (aka Horse Pond) was built by Archbishop Leopold Firmian in 1732. The pond already existed in the square for bathing horses and providing them with water (unfortunately it seems from the same source of water). Prior to Firmian’s design, the pond was adorned with a Pegasus. There is another horse pond in the city, too. The other Pferdeschwemme is located in Karajan Square, near the Festival Halls. The horse pond at this location was used to bathe the parade horses of the prince-archbishops. Below is the monument in front of the Royal Stable Wash. This sight is also a must-see if you’re a Sound of Music fan. It was in Maria and the children’s carriage-ride scene. The Sphaera is one of the works of art located in the City by German artist Stephan Balkenhol. The sphere and man stand about 9 meters (30 feet) high. It’s large enough to be seen from Hohensalzburg (pictured above). Below is how to appears up close. The Dom zu Salzburg is located in Domplatz. The church is where Wolfgang Amadeus Mozart and local priest, Joseph Mohr (wrote the lyrics to “Silent Night”), were baptized. When I was there, the city was setting up stadium seating for a concert. The seats blocked my view of the lower portion of the Cathedral and the statue of the Virgin Mary in front. I was unable to stand far enough back to take a photo of the four statues by the doors to the Church: the apostles Peter and Paul (they’re holding a key and sword), and Salzburg’s two patron saints, Rupert and Virgil (they;re holding a salt barrel and model of the church). The bronze baptismal font dates back to 1311; the lion base is even older, dating back to 1200. The original church, built in the 700s, was destroyed in a fire. You can see remains of the original church in the crypt. The church has endured a few fires since and rebuilt each time. The final consecration was in 1959 after a bomb destroyed the dome and sanctuary in 1944. The Cathedral is another sight featured in the Sound of Music. It’s in the city scene with Maria and the children singing. To find out more about visiting the Dom, check out the church’s website. Prince-Archbishop Wolf Dietrich von Raitenau built five squares around Salzburg, and Residenzplatz is probably the most beautiful one. Residenzplatz is surrounded by the Residenz, the Neue Residenz, the Salzburg Cathedral, and a continuous row of townhouses. The Residenz and Cathedral are two buildings that make up the DomQuartier (the center of archbishops’ power). In the center of the Residenzplatz is the Residence Fountain (Residenzbrunnen). The fountain was commissioned by Archbishop Guidobald Thun. He hired Italian sculptor, Tommaso di Garone, to design the Baroque masterpiece. It was built during 1656 and 1661. I’m not sure how to tall the fountain is (could only find descriptions of it being the “largest” baroque fountain in Austria). To give you an idea, here’s a photo of me (5’7″) standing in front of it. The square and fountain is another sight featured in the Sound of Music. It’s in the scene where Maria leaves the convent and singing through the city with the children. The Residenz is a palace dating back to the 13th century. The palace was where the archbishops lived when they weren’t at the Fortress. There are 180 stately rooms, some of which you can tour. One of these rooms, the Rittersaal, is where Mozart performed. To tour the Residenz, you need to purchase tickets to see the DomQuartier. Your ticket will cover the Dom, the Residenz, St. Peter’s Abbey, and rooms within these buildings. Archbishop Wolf Dietrich von Raitenau commissioned the Neue Residenz for his guests. He tore down the existing medieval homes to make way for the new building. Renovations continued over the years under the supervision of Archbishop Marcus Sitticus, Archbishop Max Gandolph von Kuenburg ,and finally Archbishop Johann Ernst Thun who added the bell tower. Today, the New Residence houses the Salzburg Museum. Each floor is dedicated to a different exhibit and includes a walkway connecting the museum with the Panorama Museum. To see another Panorama in Austria, visit Innsbruck’s Tirol Museum. For more information check out my Innsbruck post. On top of the New Residence is the famous Carillon (bell tower or Glockenspiel). The tower consists of 35 bells with a repertoire of 100 different melodies (including Mozart and “Silent Night”). You can hear the bells chime 3 times a day. You can also view the bells from a viewing platform within the Salzburg Museum. Between the Residenzplat and Mozartplatz is St. Michael’s Church. This colorful church, is the oldest parish church in Old Town. There are two levels. The Upper served as a palace chapel for the archbishops living in the Residenz. The Lower was used by the townspeople through the market entrance. In front of the church, in Mozartplatz, is the Christmas Museum! 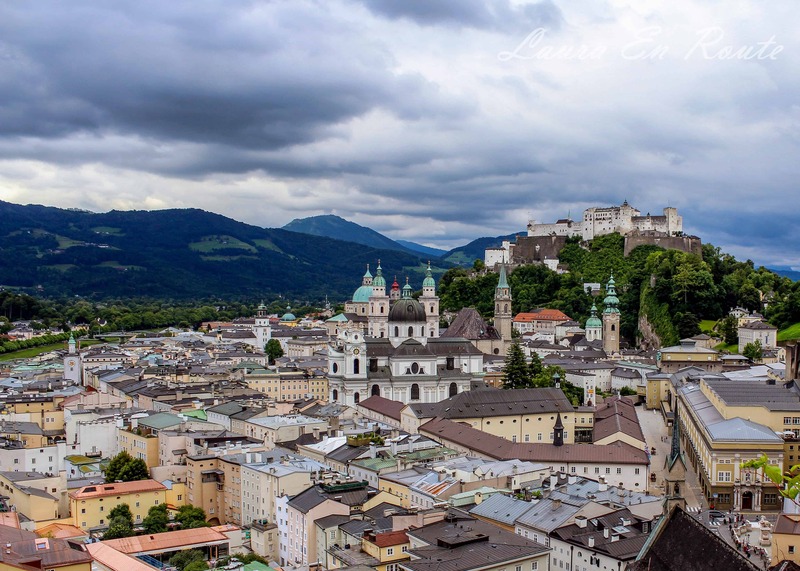 Salzburg is the birthplace of Wolfgang Amadeus Mozart, which means there are several sights throughout the city that has ties to the famous composer. (1) Mozart’s Birthplace. The Geburtshaus (house) where Mozart was born in 1756 and where his family lived for 26 years. The family moved in 1773 to what is now known as the “Mozart Residence”. No. 9 has been a museum dedicated to Mozart since 1880. The museum is filled with portraits, musical instruments, and other memorabilia from Mozart’s lifetime. The home is located on Getreidegasse, the famous shopping street. (2) Mozart Residence. Mozart’s family home is located across the river on Markartplatz. A friend of the family used the home to give dance lessons to nobility. As Mozart became well-known, their home became too small to entertain guests, so the family moved into an apartment as the “Dance Master’s House.” His mother and sister, Nannerl, died within a few years of moving into the spacious apartment. Mozart’s son lived in the home with his grandfather after Mozart moved to Vienna. The original home was destroyed during WWII, but was reconstructed in 1990s according to the original plans. Today it is a museum. (3) Mozartplatz. In the center of Mozartplatz is a monument by Ludwig Schwanthaler dedicated to the famous composer. It was erected in 1842. The statue replaced a fountain and statue of St. Michael and led to the renaming of the square, formerly named Michaelsplatz. Also in the square, is the Tourist Information office. (4) Café Tomaselli. Located between Mozartplatz and Mozart’s Birthplace is a cafe that dates back to when Mozart lived in Salzburg, making it likely he dined there. (5) Salzburg Cathedral. As mentioned above, the Cathedral is where Mozart was baptized. (6) Mozartsteg Bridge. If you’re doing your own Sound of Music walking tour, be sure to cross the Mozartsteg Bridge. It makes an appearance in the scene where Maria and the children are singing through the city. Its a few minutes walk from Mozartplatz. (7) Stiftskulinarium. You can eat at another restaurant dating back to Mozart’s time. The Stiftskulinarium, formerly known as St. Peter’s Stiftskellar, has been around since 803. (8) Mozarteum. If you want to listen to music while staying in Mozart’s hometown, you can check out concerts at the Mozarteum. There is also a Mozart Week. The ticket office is located near Mozart’s Residence. This famous shopping street in Salzburg is often listed as one of the most beautiful streets in Europe. With the colorful building facades and the varying guild signs hanging above the street, its easy to see why it makes the list. The Mirabell Palace was built in 1606 by Prince-Archbishop Wolf Dietrich for his mistress, Salome Alt. The gardens are the signature feature to the palace and admittance is free. Redisgned by another archbishop in 1690 with a Baroque style. The main features of the garden include: Pegasus Fountain, Dwarf Garden, Rose Garden, Hedge Theater, Grand Fountain, and Orangery. One room you can visit inside the Palace for free is the Marble Hall, or at least the staircase outside of the hall. We didn’t venture far enough to find the Marble Hall which is the former banquet hall of the archbishops. The Angel Staircase that leads to the hall, gets its name from the marble angels lining the stairs. Its one of the most ornate staircases I have seen (another is in the Peleș Castle in Romania, decorated with carved wood, which I visited while in undergrad). Although the Marionette Theatre is not featured in the movie, there is a scene with marionettes, so if you want to recreate this scene, check out a marionette show while in Salzburg. its located near Mozart’s Residence and the Mozarteum. After spending most of the day wandering around Salzburg, we headed back to the train station. Our next stop on our weekend getaway was Vienna (post coming soon)!